(Zenit.org) – As I write this, a small band of pro-life missionaries is driving through the vast desolate plains of Siberia, on a historic pilgrimage across Asia and Europe. On June 14, the pilgrims left the port city of Vladivostok on the Pacific Coast of Russia with a replica of the famous icon of Our Lady of Czestochowa. The icon will be venerated by tens of thousands across eight time zones in Russia, and eventually will zigzag across Europe to Fatima, Portugal and, hopefully, will even come to the United States in the spring of 2013. What would motivate a small band of believers to undertake this long and potentially dangerous journey in what is being called the “From Ocean to Ocean International Campaign in Defense of Life?” The pilgrimage of the icon, led by a coalition of Catholic and Orthodox leaders including Lech and Ewa Kowaleski of Human Life International (HLI) Poland, is intended both as a response to nearly a century of legalized abortion in Russia, and for victory over the culture of death throughout the world. The pilgrims believe that this victory for life will take place through the powerful intercession of Mary, the Mother of God. Throughout history, the faithful have called on the Blessed Virgin Mary in time of battle to win great victories against overwhelming odds. In 1571, when the Bishop of Mexico heard that Europe was threatened with an invasion from the Turkish Navy, he sent a replica of the image of Our Lady of Guadalupe to Pope Pius V. The Pope gave the image to Admiral Andrea Doria, who carried it into battle on one of the lead ships at Lepanto. On October 7, 1571, Christian forces defeated the much larger Turkish Navy and saved Europe from invasion. In 1812, Russian forces carried the icon of “The Reigning Mother of God” into battle as they drove Napoleon and his invading army out of Russia. Just over a century later, on March 1, 1917, a pious Russian widow named Eudocia received a revelation from the Blessed Virgin Mary to look for the icon, which had been lost for many years. The next day, at the same time that Tsar Nicholas of Russia abdicated his throne, the icon was found, having been hidden in a basement in the village of Kolomenskoye, just outside Moscow. Many people began to venerate the icon and miraculous healings began to occur, even as the October Revolution was launched against the ruling Tsars of Russia. The Mother of God told her that if the icon was marched around the Kremlin seven times it would not fall. Tragically, her requests went unheeded. The Bolsheviks captured the Kremlin, marking the onset of Russia’s century of darkness. The icon of Our Lady of Czestochowa has a fascinating history of its own. Tradition holds that St. Luke the Evangelist himself “wrote” the icon of what has now become known as “Our Lady of Czestochowa” on a cypress table made by Jesus Himself. The Icon was damaged by anti-Catholic, Hussite raiders in 1430 who slashed it and attempted to burn it, so much so that today she is referred to as the “Black Madonna.” In a sense, the icon is a symbol of Poland herself, scarred but persevering in faith. Our Lady has interceded for the Polish people many times in her history. Just a relatively recent example, from May 1-7, 1979, many Poles held what became known as “The Siege of Jericho”. At the shrine of Our Lady of Czestochowa they prayed continuous rosaries for the intention that the Communist government would relax its restrictions on the visit of Pope John Paul II to his native land. On May 7, the Polish government unexpectedly relented and dropped the major obstacles that were preventing the Pope’s visit. Blessed Pope John Paul lit a fire with his bold proclamation of the Gospel “behind enemy lines.” The Pope’s visit set in motion the most remarkable peaceful revolution of the century, eventually bringing down Communism in the Soviet Union and all of Eastern Europe. Russia again finds herself facing enormous difficulties today—difficulties of her own making. In 1920, Russia was the first country to legalize abortion for any reason. Josef Stalin again outlawed abortion in 1936, not because he respected human life, but he saw that it was weakening his nation and decimating the population of Russia along with war, the various purges and the starvation of millions. Abortion was legalized again after his death in 1954. The number of babies lost again skyrocketed, peaking in 1964 with 5.6 million abortions performed. Abortion remains the primary means of birth control in Russia, although the rate is falling (still at a very high rate of just under 40% of all pregnancies ending in abortion in 2010). But now, Russia knows she has a problem. Her population continues to decline at an alarming rate. The total fertility rate of Russian women hit a historic low in 1999 of 1.16. By 2010, it had risen slightly to 1.59. Even President Vladmir Putin has encouraged Russian families to have more children by offering economic incentives, but these policies are having little effect. Against this backdrop of demographic collapse, a faithful few are turning their eyes to the Mother of God. This is fitting since Blessed Pope John Paul’s monumental encyclical Evangelium Vitae, which he called “central to the whole Magisterium of my Pontificate,” and which closes with a prayer to the Blessed Virgin Mary for victory over the culture of death. Our Lady under her title of Our Lady of Czestochowa is venerated both in the East and the West. The icon arrived in Vladivostok on June 11 and was venerated in several churches, including the main Cathedral of St. Nicholas. Enthusiastic crowds have accompanied the Blessed Virgin asking for her prayers, and have also attended the pro-life conferences that are taking place as part of the pilgrimage. The fact that Russian Orthodox leaders are working together with Roman Catholics to coordinate the historic pilgrimage through Europe and Asia is no small feat. We pray that our shared devotion to the Blessed Mother may be an occasion for the building of mutual respect, and for collaboration in other such efforts for the promotion of faith, life and the family in the future. Please pray with us that God will bless the efforts of this tiny band of missionaries and that Our Blessed Mother will awaken the people in every place she visits, to be open to life and a respect marriage and family life. Visit the website of the From Ocean to Ocean International Campaign for the Defense of Life for more information on the progress of this historic pilgrimage. This article was originally posted on Zenit.org and is reprinted with permission. 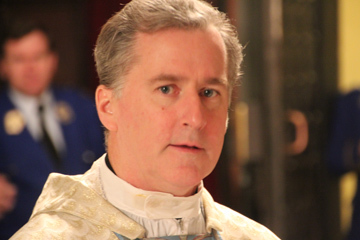 Father Peter West is vice president for missions for Human Life International, the world’s largest pro-life organization, which is coordinating the From Ocean to Ocean pilgrimage of the icon of Our Lady of Czestochowa.